Amethyst is a member of the quartz family, a silicon dioxide with a hardness of 7 and a trigonal crystalline structure. 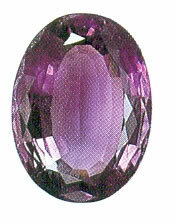 In its crystalline form amethyst ranges from pale to deep violet. This is a stone traditionally worn to guard against drunkenness, and to instill a sober and serious mind. Regarding the therapeutic use Amethyst helps to clear and transform energies in the environment where it is placed. Therefore, it is an aid to help you release imbalanced energies or protect yourself in an imbalanced environment. It is also used to help us to release the negative energy and unnecessary thoughts.